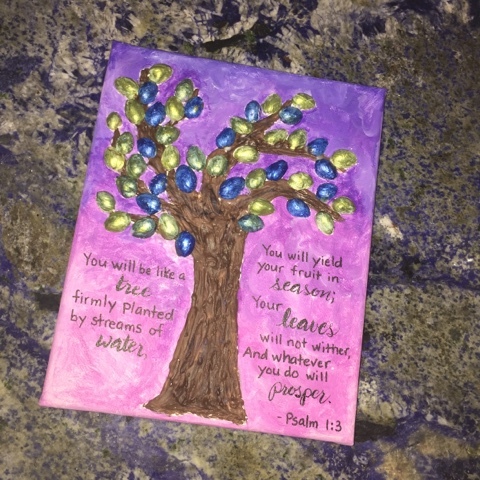 Now that I'm teaching Sunday School at our synagogue, I'm thinking of arts and crafts I can do with students that relate to what I'm teaching. And I seem to have more ideas for art than I have time for in class. So I'm going to share them here on my blog for others to try and for me to archive my ideas. 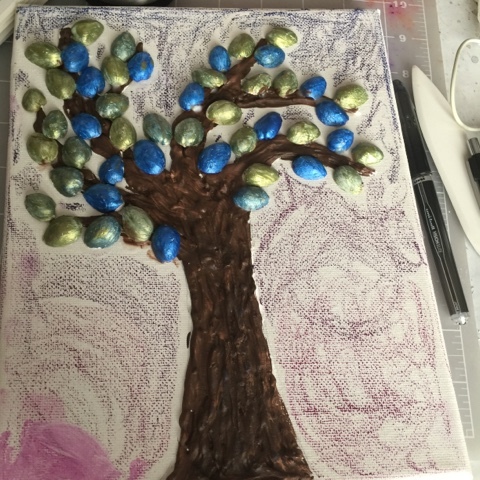 Tu B'Shevat is a holiday all about the tree. And one of ways we celebrate it is to enjoy fruits and nuts from from trees. And our class certainly did that by making a treat made from matzah and white chocolate with dried fruits and nuts. And don't waste the shells of the nuts! I love using pistachio shells in my art. Here is one I did several years ago. 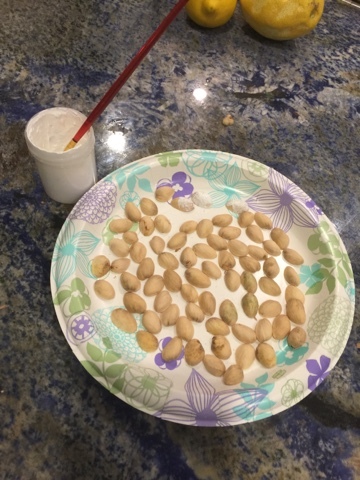 My idea is to use pistachio shells as leaves for a tree. If you notice in the picture, the tree trunk and branches are textured. This is done with molding paste. 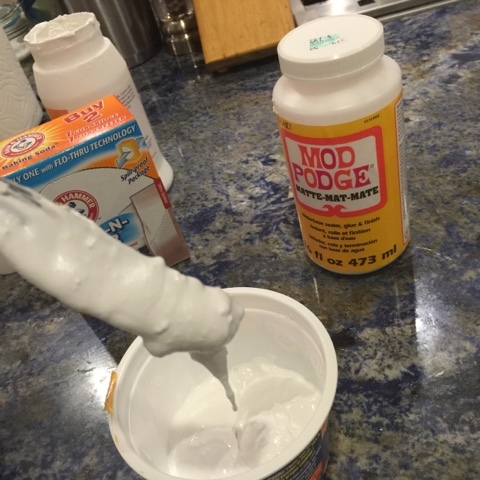 You can purchase molding paste at a local craft store. It's not cheap and if this is the only time you'll use it, it's worth the price. 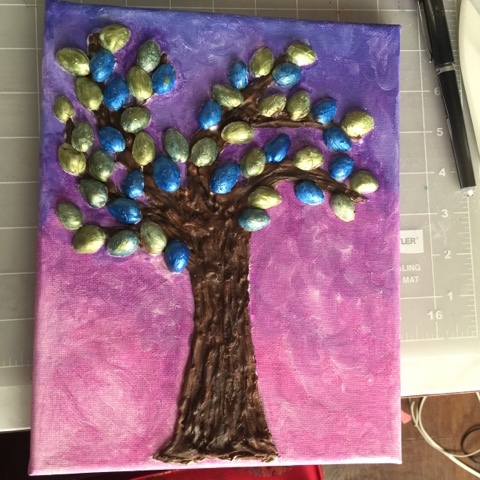 You can totally omit the texture and just paint the tree trunk and branches. The consistency you want is a thick paste, loose enough to spread around but firm enough to maintain texture. I put the mixture into a ziplock bag and cut a small opening at the corner to pipe the paste. I used en end of a paint brush to add streaks and other texture. Let this dry overnight. 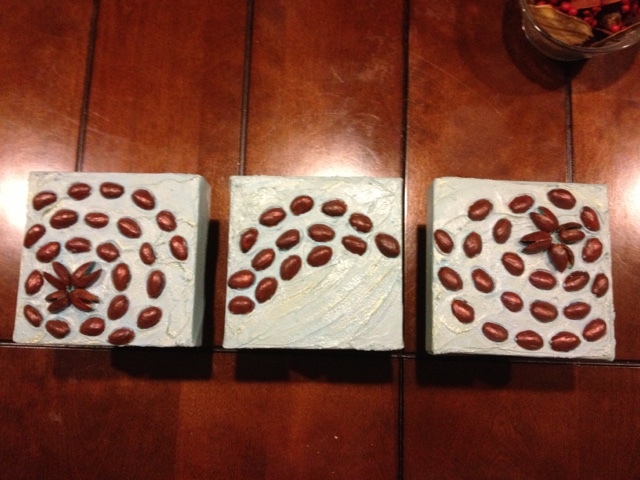 While that is drying, I prepped the pistachio shells. I began by applying gesso to the shells. 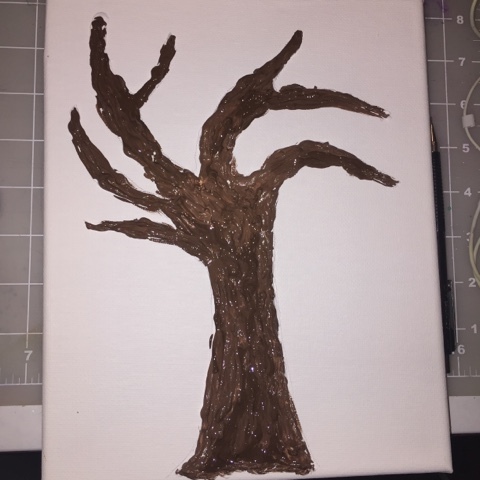 Gesso is an acrylic base coat that can be used so that paint will stick. You don't have to use gesso but you will have to paint them more than once. 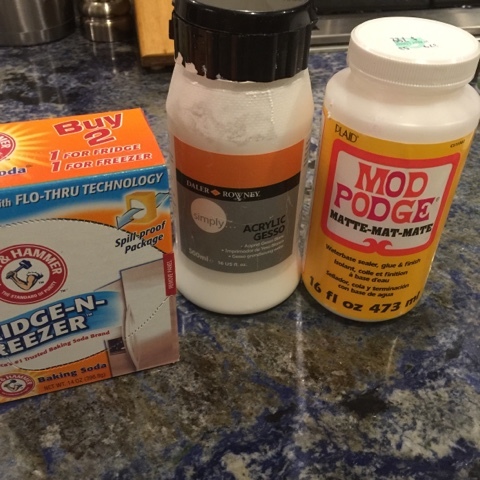 If you made your own molding paste, you will have plenty of gesso left. 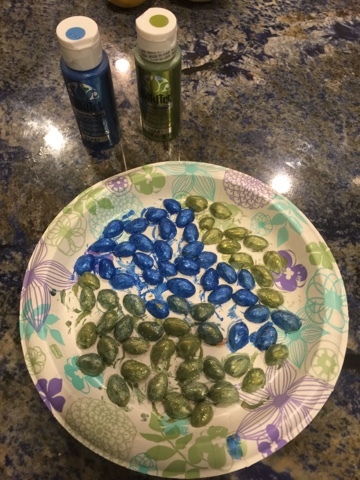 I then painted the shells with metallic green and blue paint. The next day, I painted the tree trunk. 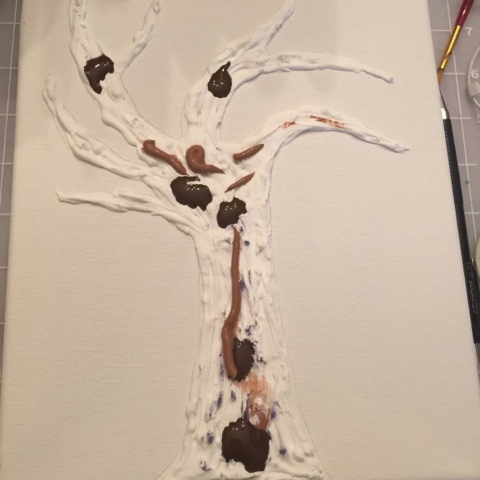 I just squeezed drops of paints onto the tree and used a brush to move the paint around. I would also recommend painting the background now before putting the shells on. Glue the shells on. I used Mod Podge Ann's don't be afraid to add more glue around the shells so they will stick. Glue will dry clear. You can also use a hot glue gun (adults only). I used Inktense blocks and gesso for my background but you can use any paint you'd like! I found a quote I wanted to use and write it with a sharpie and a brush marker. I also added a bit of charcoal to the grooves in the tree truck for depth. This can be used to depict the burning bush by painting the shells with yellow, orange and red. The shells can be used to create flowers and other fun things. Peanut shells would be fun too. 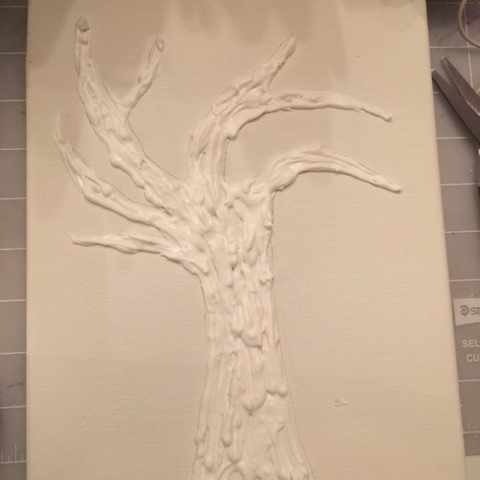 The molding paste can add so much texture to your art. I've used them with stencils. You can do leaf impressions too. This was a quick, fun art that can be done with kids 3rd grade and up with supervision. If you're using acrylic paints, make sure to protect your clothing and furniture. Have fun!! Kari- totally rockin' blog entry! !